IHG® Rewards Club - eBooks - H.O.P.E. H.O.P.E. is an inspirational book that explores the many facets of what it means to be a Christian today, detailing the times God can support our endeavors, heal our deepest wounds, and work miracles before our very eyes. 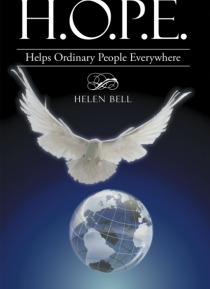 Helen Bell provides readers with seven personal stories ranging from an authentic account of what happened when she questioned the Lord, to trusting God when a beloved child beca… me deathly ill, to believing how Gods timing has always been the best timing (even if it took her several years to realize it). With well-chosen scriptures throughout and a reflective question-and-answer design at the end of each chapter, Bells H.O.P.E. will entertain, enlighten, and help every person who reads it to grow closer to the Lord.